Topping the list of corporate donors is the MGM Grand, which has donated SIX HUNDRED GRAND ($600,000) to the organization. And anyone who believes that doesn’t influence their content, even if only in subtle ways, probably owns stock in one of those Nigerian gold mines you read about in spam emails. And while the Nevada Independent may be “nonpartisan,” it is anything but unbiased. Indy editor Jon Ralston is an obnoxious, card-carrying liberal who’s been on a jihad against conservatives for decades. His current crusade is hunting down and trying to kill the campaigns of Nevada Republicans such as Adam Laxalt and Dean Heller while accepting donations from their opponents and supporters of their opponents. Bias in content isn’t just what’s written, but what’s written about. 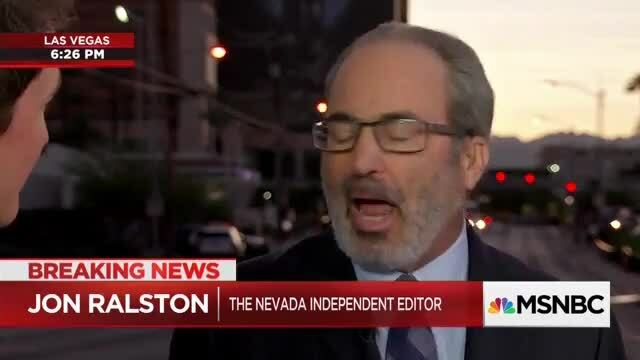 Indeed, in a recent Ralston rant, Nevada’s #2 liberal blogger whined that Laxalt and Heller’s campaigns refuse to communicate with his publication even as both do regular and extensive interviews with almost every other media organization in the state. Ralston tries to hide behind the fact that his blog regularly discloses the identity of his donors. But simple disclosure doesn’t wipe away the clear conflict of interest rooted in the Law of Reciprocity. And while such a conflict is simply part of doing business in the non-profit world – “You can’t save the world if you can’t pay the rent” – to pretend such a conflict doesn’t exist and doesn’t influence content decisions is not only unseemly, but intellectually dishonest. Laxalt is running against Democrat Steve Sisolak for governor, who has donated to the Nevada Indy while Laxalt has refused to cough up. But according to Ralston, the editors of the newspaper financially supported by Mr. Adelson only published an opinion column on an issue because Mr. Adelson also financially supports a candidate Ralston hates. Yet we’re to believe Ralston isn’t influenced by Sisolak’s financial support. Look, if Ralston wanted to be consistent in his claim that corporate donations don’t influence content on his blog, he’d stop accusing others of the same thing. But expecting Jon Ralston to be intellectually honest is about as realistic as expecting a scorpion not to sting you. In addition, if “Jihadi Jon” really believes (he doesn’t) that donations, especially large ones, don’t influence behavior, then he’d stop whining about donors who contribute to political campaigns. But as one can readily see in his “Adelson-backed” reference in the above twit-tweet, he doesn’t believe that for a minute. The fact is, Jon Ralston is a liberal “fake news” editor whose clear bias and intellectual dishonesty hurts the reputations of the professional reporters who write for his blog. Unfortunately for them, he just can’t shut up. Big money donations will do that to you. Disclaimer: Yes, Mr. Adelson’s Las Vegas Sands has been a generous sponsor of my Conservative Leadership Conference over the years. And yes, as such I’m more than happy to make the editorial decision today to use this column to once again expose Jon Ralston for the hypocritical jackass that he is. It’s a win-win scenario rooted in my fully- and readily-admitted conservative bias.